Health facilities in Syria are systematically targeted, on a scale unprecedented in modern history. WITH THE TARGETING OF OUR HOSPITALS, I DON’T THINK ANYTHING CAN PROTECT OUR MEDICAL STAFF EXCEPT BEING UNDERGROUND. While the international community fails to protect Syrian medics from systematic aerial attacks on their hospitals, Syrians have developed an entire underground system to help protect patients and medical colleagues as best they can. The fortification of medical facilities is now considered a standard practice in Syria. Field hospitals have been driven underground, into basements, fortified with sandbags and cement walls, and into caves. These facilities have saved the lives of countless health workers and patients, preserved critical donor-funded equipment, and helped prevent displacement by providing communities with emergency care. However, while Syrian medics have adapted their operations to fit these unique horrors, international donor governments have not adapted their funding. Budget lines for the emergency funding they receive can include “protection” work, but infrastructure building, even for protective purposes, often falls outside of their mandate. The divide between emergency humanitarian and development funding is creating a gap for projects that bridge the two, like protective measures for hospitals in Syria. Medics are paying the price. IT COSTS LESS OVER TIME AND IS MOST EFFECTIVE TO BUILD UNDERGROUND HOSPITALS. 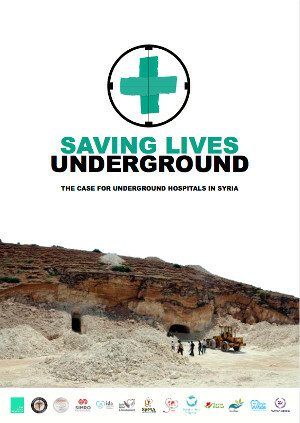 Underground hospitals are much, much safer. They are proven to protect medical staff compared to above-ground facilities - while at least 814 health workers have been killed in Syria since the beginning of the conflict, no health workers have been directly killed from an attack while working in a fully underground hospital. This is the #1 donor demand of Syrian health workers. Funds for fortified and underground hospitals are the number one protection recommendation coming from the Turkey-based ‘Health Cluster’ serving Syria, comprised of all major medical groups operating in Syria. Three major models of underground hospitals have been developed. Syrian engineers and medics have developed three major models of underground hospitals - basement hospitals, cave hospitals, and fully underground hospitals. 50% of hospitals in opposition-held Syria have no measure of reinforcement or fortification, showing the scope of need. The Idlib governorate is a priority area for fortification, especially as attacks using advanced weapons like bunker buster bombs and chemical weapons escalate. It costs only $719,000 to re-fortify all of the existing priority facilities identified in Idlib.